The Hotel Jardín Tecina is located on the captivating island of La Gomera - the second smallest of the Canary Islands. This unique resort stands complete with fabulous views of the Atlantic Ocean and of its neighbouring island of Tenerife. Sitting on top of the village with an array of restaurants and bars with a beach, the Hotel Jardin Tecina would make a fantastic base for your next golfing getaway. The hotel is situated amongst over 70,000m² of lush greenery where over 50 species of plants and flowers from all over the world have come together to make a green paradise surrounding this hotel. 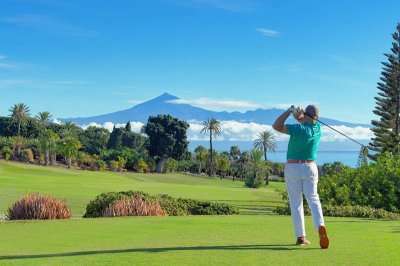 From the resort, there is direct access to the fishing village of Playa de Santiago, making sure that after a scenic and challenging round on Tecina Golf, you can relax for the remainder of the day, looking out at the Atlantic or take a walk to the village. Poised on a clifftop above the southern resort of Playa de Santiago, here guests are offered views of unrivalled beauty, including the majestic Mount Teide as well as clear blue ocean for miles. For golf fanatics looking to play a spectacular course whilst still being able to indulge in luxury and tranquillity, this hotel is for you. Sitting on top of the beautiful Tecina Golf course where breath-taking scenic views are offered throughout, you simply can’t go wrong with this hotel. All rooms at this property take advantage of its stunning surroundings by offering garden or sea views which can be admired from a private balcony/terrace. Furthermore, rooms here include all the modern luxuries one would expect from a 4-star property, such as complimentary Wi-Fi, air conditioning, a well-stocked minibar and satellite television. Rooms at this hotel have been designed with your comfort in mind, and range from a twin room to a duplex family suite therefore your needs can be accommodated for. Rooms are dotted around the gardens here in small white houses creating a beautiful setting. The range of leisure facilities here is extensive, and can accommodate all members of the family. There is an impressive 5 pool areas, providing an option for those looking for a quieter atmosphere. Sporting facilities include four tennis courts and two squash courts. Furthermore, mini-golf, table tennis and beach volleyball is also on offer. For guests to unwind, they can visit the hotel spa to indulge in a signature massage or facial. The Hotel Jardin Tecina offers a wide range of drinking and dining options to its guests where all tastes will be satisfied. A daily buffet is on offer at the main restaurant, and for true Spanish and Canary cuisine guests need not look further than the Tasca Fandango where they can enjoy traditional dishes at an exceptional standard. Five bars are on offer here to guests, and the terrace bar makes the perfect place to meet with friends and family to conclude a relaxing day.